The telecommunications industry has advanced in rapid, significant and unpredictable ways into the 21st century. 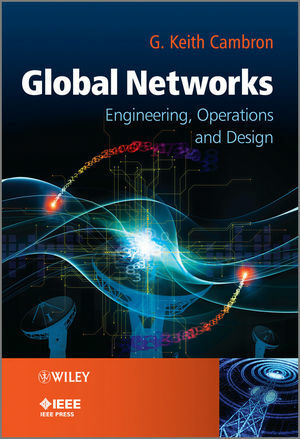 Global Networks: Design, Engineering and Operation guides the global industry and academia even further by providing an in-depth look at the current and developing trends, as well as examining the complex issues of developing, introducing, and managing cutting-edge telecommunications technologies. The author draws upon his considerable experience in the telecommunications industry to educate engineers designing equipment and systems on the hardware and software features essential to fault tolerant operation. He describes how to design networks that are fault tolerant and global in scope; how to identify best engineering and operations practices; and examines the role of technology labs in carrier networks. Software and hardware engineering practices are covered in depth. Hardware and software designs are explained with an emphasis on application and interaction of craft and operators with equipment and systems. The author proposes that equipment, systems and network designs should be integrated with the engineering and operations teams that run them. Practice, experience and a historical background are used to describe which designs and technologies fit which network services and applications. Global Networks is a complete and thorough assessment of the communications industry today, written by an author of international renown.